Continuing its commitment to developing and delivering industry-leading storage technologies, IBM® introduces the IBM Storwize® V7000 solution powered by IBM Spectrum™ Virtualize. This innovative storage offering delivers essential storage efficiency technologies and exceptional ease of use and performance, all integrated into a compact, modular design that is offered at a competitive, midrange price. The IBM Storwize V7000 solution incorporates some of the top IBM technologies that are typically found only in enterprise-class storage systems, raising the standard for storage efficiency in midrange disk systems. This cutting-edge storage system extends the comprehensive storage portfolio from IBM and can help change the way organizations address the ongoing information explosion. 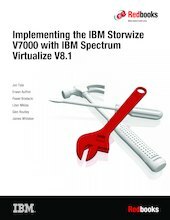 This IBM Redbooks® publication introduces the features and functions of the IBM Storwize V7000 and IBM Spectrum Virtualize™ V8.1 system through several examples. This book is aimed at pre-sales and post-sales technical support and marketing and storage administrators. It helps you understand the architecture of the Storwize V7000, how to implement it, and how to take advantage of its industry-leading functions and features.